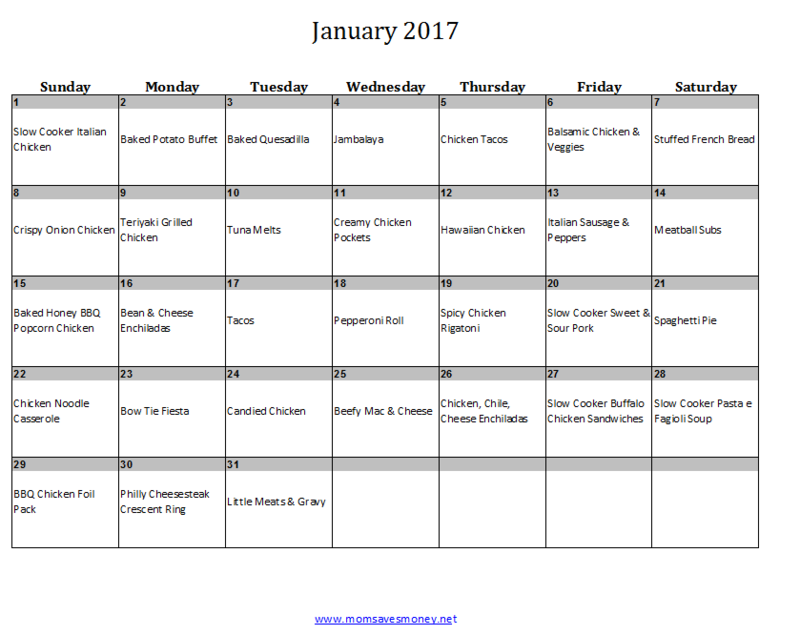 January 2017 Monthly Menu Plan! Happy New Year!!!! Well, almost Happy New Year! I pray that 2017 finds you joyful, athletic, wealthy, ecstatic, rich, merry, buff, and full of free time on your hands! But just in case it doesn’t start out that way, have you considered a menu plan that will help you save stress? Buy only the ingredients you need? Plan ahead on when meals can be made? Well, you should! And if not now, then when? And which menu plan should you use? The one that has you eating Peanut Butter and Jelly for every meal? Nah! It’d work though – a menu plan doesn’t need to be all fancy. You’d know exactly what ingredients you need. You’d know exactly how much prep time you need. You’d get a good idea of what it costs to feed your family. But you’d get bored. And this is America – we’re not exactly known for wanting to be bored by our food! So use this menu plan. Or one like it. Take this plan and use it exactly as it is. Or take this plan and use it just as a starting point – it’s up to you! 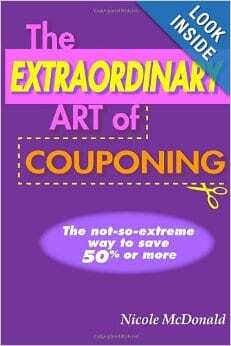 The easy-to-print version as a .PDF. The pre-filled file in Excel. An empty file in Excel. 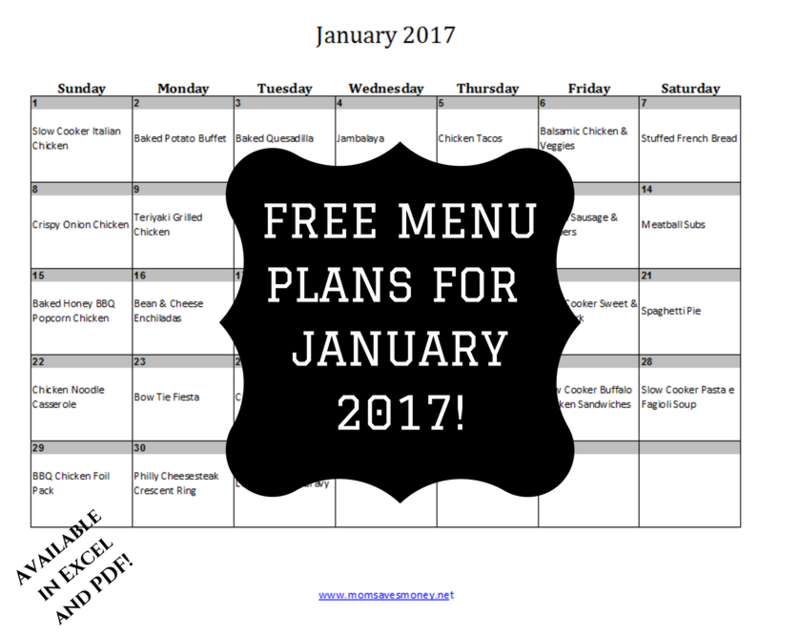 Make your own menu plan! Its okay if you don’t like these recipes or these ideas – make your own! Just open the Excel version, delete what you don’t want and keep what you do want! I have a menu plan that works for my family – you should have one that works for yours! What if I don’t cook every night? Awesome! I don’t either – we often have leftovers 2-3 night/week. Just take this basic plan, cut out some meals and make leftovers part of your plan! What if I don’t want a particular meal on a specific night? Awesome! Just take this basic plan and swap meals around. What if I don’t eat beef? Or chicken? Or pork? Awesome! Just take this basic plan, remove the foods you won’t eat and put in foods you will eat. What if I don’t know how to make that meal? Awesome! Included are the links for the recipe that I usually use. What if we always have pizza on Friday nights? Awesome! (Can I come over?) Just remove my Friday meals and put in pizza. What if I don’t like your recipe? Awesome! Use whichever recipe you normally use and just use this basic plan as a suggestion. 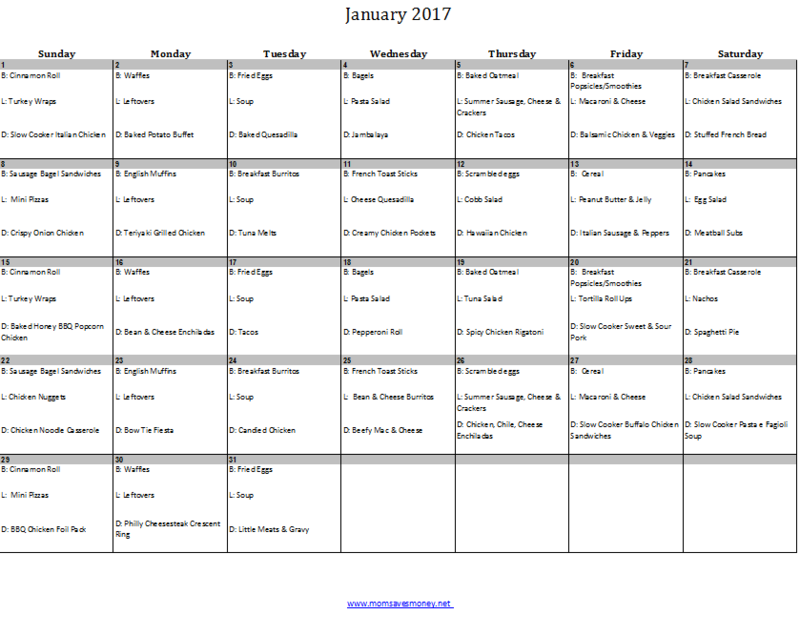 What if I have my own monthly menu plan? Awesome! Care to share it? Share it down below in the comments so that we all can see it and be inspired! What’s cool about this menu plan? I kept it simple around the holidays – go into the holiday relaxed and enjoy yourself! Breakfast & lunch are simple and repetitive while still providing variety. For dinners, I try to have a lot more variety each week – some beef, some chicken, and some pastas. That way you won’t get too bored. There are also plenty of ways to save time when using this menu plan. Examples: When prepping chicken at the beginning of the month, make enough for the other recipes and freeze it for future use. When making ground beef, brown 2-3 times the normal amount and freeze that. Check out these easy crockpot instructions for bulk cooking chicken and bulk cooking ground beef. It makes it super quick to pull meals together! These are fabulous! I love the fill-in-your own option. I not only pinned them to my group board “Free Printables” on Pinterest, but also shared them on my sub-reddit “Free Printables” on Reddit. Thanks for sharing. That’s awesome! I think they’re the bees knees, but I’m quite biased!